William Norval Craig was an American competition swimmer, Olympic champion, and world record-holder. He represented the United States at the 1964 Summer Olympics in Tokyo, where he won a gold medal by swimming the breaststroke leg for the first-place U.S. team in the men's 4×100-meter medley relay. Craig and his teammates Thompson Mann (backstroke), Fred Schmidt (butterfly) and Steve Clark (freestyle) set a new medley relay world record of 3:58.4. Craig attended the University of Southern California (USC), where he swam for the USC Trojans swimming and diving team. He graduated in 1967. In 1965 Mann won the national indoor and outdoor titles in both the 100 and 200 yd backstroke, setting a world's best time and American record over 100 yd. He was inducted into the International Swimming Hall of Fame in 1984,  and the Virginia Sports Hall of Fame in 1988. The International Swimming Hall of Fame and Museum (ISHOF) is a history museum and hall of fame, located at One Hall of Fame Drive, Fort Lauderdale, Florida, United States, operated by private interests and serving as the central point for the study of the history of swimming in the United States and around the world. Exhibits include ancient art and both reproductions and original art depicting famous moments in swimming history, swimwear, and civil rights, as well as memorabilia and artifacts belonging to persons who have promoted or excelled in aquatics. It is recognized by FINA as the official hall for the aquatics sports. 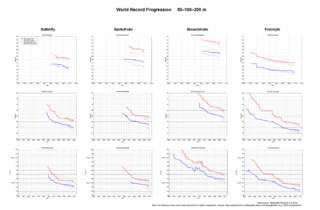 This is a history of the 100 m backstroke world record as swum in both long-course pools and short-course (25 m) pools—the two categories recognized/tracked by FINA. Sharon Marie Stouder, also known by her married name Sharon Stouder Clark, was an American competition swimmer, three-time Olympic champion, and former world record-holder in four events. Jeffrey Norman Rouse is an American former competition swimmer, three-time Olympic champion, and former world record-holder in three events. Richard John Carey is an American former competition swimmer, three-time Olympic champion, and former world record-holder in three events. Carey specialized in the backstroke. At the 1984 Summer Olympics in Los Angeles, he won three gold medals. He broke nine world records, five individually, and also was a double world champion. 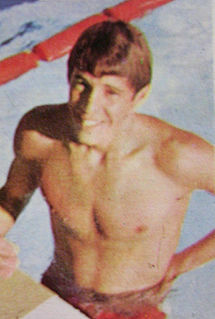 He was named as the Swimmer of the Year in 1983 by Swimming World magazine. Melissa Louise Belote, also known by her current married name Melissa Belote Ripley, is an American former competition swimmer, three-time Olympic champion, and former world record-holder in two events. She represented the United States at the 1972 and 1976 Olympics. David Charles "Dave" Berkoff is an American former competition swimmer, Olympic champion, and former world record-holder in two events. Berkoff was a backstroke specialist who won a total of four Olympic medals during his career at two different Olympic Games. He is best known for his powerful underwater start, the eponymous "Berkoff Blastoff". Stephen Edward Clark is an American former competition swimmer, Olympic champion, and former world record-holder. Charles Buchanan Hickcox was an American competition swimmer, three-time Olympic champion, and former world record-holder in six events. Kaye Marie Hall, later known by her married name Kaye Greff, is an American former competition swimmer, two-time Olympic champion, and former world record-holder in two events. Lynn Edythe Burke, also known by her married name Lynn McConville, is an American former competition swimmer, Olympic champion, and former world record-holder in two events. She competed at the 1960 Summer Olympics in Rome, where she won the gold medal in women's 100-meter backstroke in a new Olympic record time of 1:09.3. She won a second gold medal by swimming the backstroke leg for the winning U.S. team in the 4×100-meter medley relay, together with teammates Patty Kempner (breaststroke), Carolyn Schuler (butterfly), and Chris von Saltza (freestyle). The U.S medley relay team set a new world record in the event final of 4:41.1. Cathy Jane Ferguson is an American former competition swimmer, Olympic champion, and former world record-holder. She competed at the 1964 Olympic Games in Tokyo, Japan, where she received the gold medal for winning the women's 100-meter backstroke, and another gold as a member of the first-place U.S. team in the women's 4×100-meter medley relay. Cynthia Lee Goyette, also known by her married name Cynthia McCulloch, is an American former competition swimmer, Olympic champion, and former world record-holder. She represented the United States as an 18-year-old at the 1964 Summer Olympics in Tokyo. She won a gold medal for swimming the breaststroke leg for the first-place U.S. team in the women's 4 × 100-metre medley relay. The U.S. relay team set a new world record of 4:33.9 in the event final; Goyette's teammates included Cathy Ferguson (backstroke), Sharon Stouder (butterfly), and Kathy Ellis (freestyle). Kathleen Ellis is an American former competition swimmer, two-time Olympic champion, and former world record-holder in three events. Frederick Weber Schmidt is an American former competition swimmer, Olympic champion, and former world record-holder. Eleanor Suzanne Daniel, also known by her married name Ellie Drye, is an American former competition swimmer, four-time Olympic medalist, and former world record-holder. 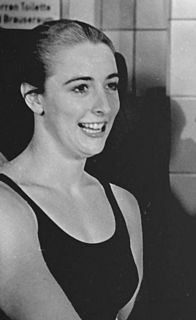 Lillian Debra Watson, commonly known by her nickname Pokey Watson, and later by her married name Lillian Richardson, is an American former competition swimmer, two-time Olympic champion, and former world record-holder in three events. Robert Earl Bennett is an American former competition swimmer, Olympic medalist, and former world record-holder. Betsy Mitchell is an American competition swimmer who was a world record-holder, world champion, and Olympic gold and silver medalist. She also was a member of the United States' 1994 Rowing World Championship team. Susanne Jean Atwood is an American former competition swimmer, two-time Olympic medalist, and former world record-holder in two events. Richard Michael McGeagh is an American former competition swimmer and former world record-holder. 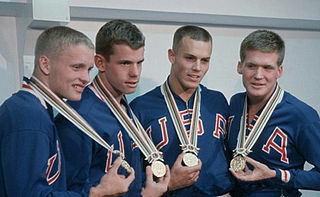 McGeagh participated in the 1964 Summer Olympics in Tokyo, Japan. He swam the backstroke leg for the gold medal-winning U.S. team in the men's 4×100-meter medley relay during the preliminary heats of the event. He did not receive a medal, however; under the 1964 Olympic swimming rules only swimmers who competed in the event final were medal-eligible. Wikimedia Commons has media related to Thompson Mann . ↑ International Swimming Hall of Fame, Honorees, Thompson Mann (USA). Retrieved April 11, 2015.